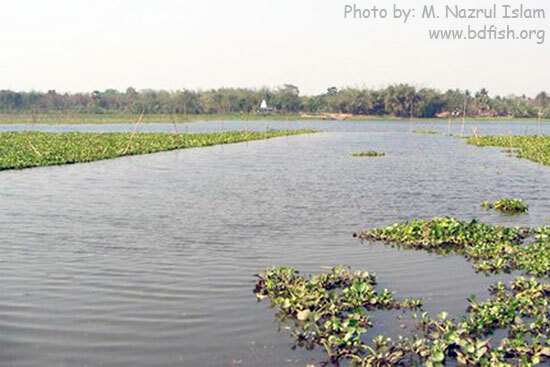 Baluhar Baor area is a “Hot spot (a very rich area in biodiversity)” of Bangladesh. A total of 3 major species of Annelids, 20 species of Arthropods, 8 species of Mollusks, 72 species of Fishes, 3 species of Amphibians, 13 species of Reptiles, 52 different species of Birds, 16 species of Mammals, 22 species of Aquatic macrophytes and 145 species of flowering plants (Sub-kingdom: Phanerogamia) were identified in the Baluhar Baor and its adjacent area. 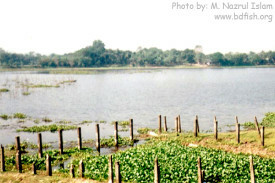 Baluhar Baor (Ox-bow Lake) is an immemorial and immense water reservoir. It comprises a total area of 282 hectares. Baors are commonly rich in aquatic biodiversity with a greater prospective of fisheries resources. This ecosystem also supports a luxuriant growth of aquatic macrophytes, which generates primary production and provides breeding ground for fishes and shelter for migratory birds (Islam et. al. 2008a). Aquatic habitat also influenced by the meteorological and physico-chemical factors (Islam et. al. 2004). Therefore, the fish and their biotic and abiotic environments is not an isolated phenomenon. Ecological value of these Baor plants is also being increasingly recognized because it provides habitat to a large number of wild animals and act as escape cover and flood safe, nesting sites for many birds and other wild animals. About 43% of the Nation’s endangered species depend on Baor for food, shelter and breeding as well as survival. Marsh plants and their associated habitat provide important breeding areas for a wide variety of waterfowls and important staging areas for a large number of resident and migratory birds. Plants also contribute to the biological cycling and mobilization of chemical elements. The dry matter and nutrients in Baor plants and other food chain of the ecosystem directly support a wealth of fisheries resources. Aquatic vegetation beds act as spawning grounds and shelter juveniles of a large variety of fishes and prawns. Dense vegetation and hydrologic regime of the Baor provide vital nutrient elements not only within but also beyond their immediate boundary down streams. Wildlife populations of Bangladesh are decreasing tremendously in compare to other countries of the world due to the destruction of the habitat and shortage of food (Islam et. al. 2003). Considering the economic and environmental values of Baor ecosystem the present author has undertaken a detail study on the abundance of species diversity in a well known Baor ecosystem named Baluhor Baor. Baluhor Baor is situated within 23°27′ to 23°50′ North latitude and 88°55′ to 89°05′ East longitudes. 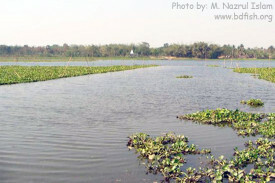 It belongs to Kotchandpur Upazilla under the district of Jhenaidah and is about 152 km away from the capital city Dhaka. Topographically Baluhar Baor area is collectively roundest and high land. The bank area of the Baor is composed of mixture of sand and clay (medium textured soil). Due to wind action, water movement, water wave and soil erosion, the slopes of Baor are uneven and 4 khals are connected to the Baor. Five villages as well as several facilities are situated the Bank of the Baor. The total area of the Baor is 282 ha having a mean depth of 5.88 ± 0.701 m. It is a perennial water body and mostly rain fed. 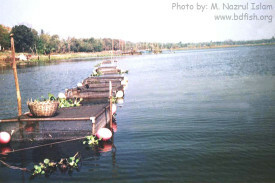 Well managed aquaculture has been carried out in the Baor. 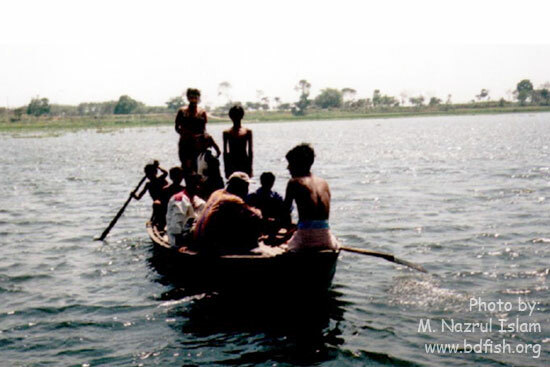 The observation was carried out 12 months between December 2001 and November 2002 mainly on the author own field experience, information received from fishermen, local people, forest employees and the works of previous workers. The identification of different organism up to genus and species were made with identification key and standard literature provided by different authors. The day and night observation were made with a binocular in all the seasons. Class-wise species were recorded in the field notebook as soon as sighted in the field. If failed to identify in the field, the identifying characters were recorded and later on identified mainly with the help of books and consulting with others. During the study period a total of 3 (major) species of Annelids under 2 classes (Oligochaeta and Hirudinaria) and 20 species of Arthropods under the 4 classes (Crustacea, Insecta, Myriapoda and Arachnida) were identified. The presence of a total of 17 species of freshwater molluscs under 7 families, viz. Viviparidae, Ampullariidae, Hydrobidae, Assimineidae, Melanniidae, Lymnaidae and Planorbidae together with some ecological notes has been confirmed by Jahan (1993) from Bangladesh. In course of investigation a total of 7 species of fresh water gastropods and one species pelecypods were encountered in habitat of the Baluhar Baor area. 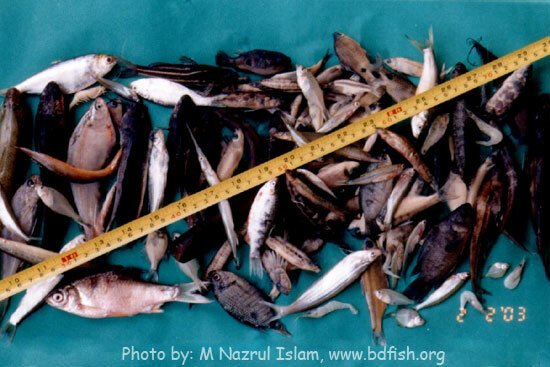 There are about 260 species of fishes present in the Inland water bodies (Rahman, 2005) and 475 species are recorded from the marine water (FFYP) of which 65 species are exported commercially (Hossain, 1970). 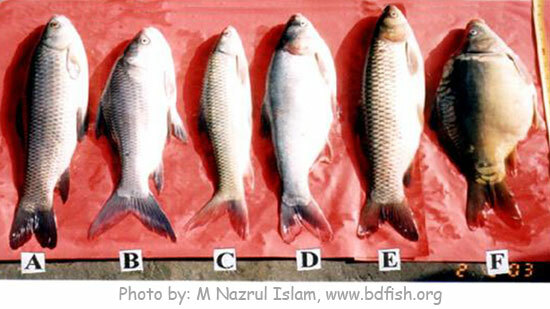 A total of 12~15 culturable species of Exotic fishes have been introduced in Bangladesh. During the study period a total of 72 species were identified, distributed among 48 genera, 23 families and 11 orders. 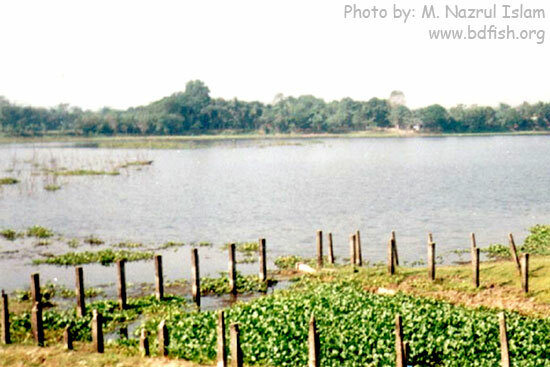 A total of 8 different cultured fish species present in the Baluhar Baor. Most of the non-cultured indigenous fish species are commercially important. 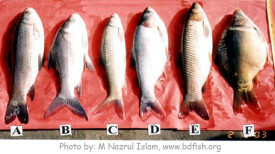 The stocked fish species are Labeo rohita (Rohu), Catla catla (Catla), Cirrhinus mrigala (Mrigal), Labeo calbasu (Kalibaus), Cteropharyngodon idella (Grass Carp), Cyprinus carpio var. communis (Scale Carp), Cyprinus carpio var. specularies (Mirror Carp) and Hypopthalmichthys molitrix (Silver Carp). Previously Islam et. al. (2003) reported that as tetrapodan diversity; 3 species of Amphibians, 13 species of Reptilians, 52 species of Birds and 16 species of Mammalian fauna of the Baluhar Baor and its adjacent area. A total of 22 species of aquatic macrophytes have been recorded from the Baor. Of these one species belonged to Charophyta (algae), 2 species belonged to Pteridophyta (ferns), 9 species from the Monocotyledons and 11 species from the Dicotyledons. Various types of garden flowers and fruit trees have been grown on these slopes of Baor on which different kinds of birds, few of reptiles and mammals sit. Besides, Baor ecosystem supports a wide range of biodiversity of flora and fauna providing breeding, nursing, feeding, sheltering and roosting habitats (Islam et. al. 2003). Many migratory birds are response to Baor habitat for their food availability. Few years ago, some species like vulture, Owl, Bitheron, Hanri Chancha, Baya, Storks were common species but now, these species are rare. Islam et. al. (2003, 2008b) mentioned, the mainly reason for the decrease in numbers of species is due to destruction of the habitat (agricultural and industrial development) and shortage of food. Rahman AKA (2005) Fresh water fishes of Bangladesh. Zoological Society of Bangladesh, Dhaka. 364 pp. Visited 1,272 times, 1 visits today | Have any fisheries relevant question?